The Visitor Information Center for the Hualien area is located in front of Hualien Station (right side). 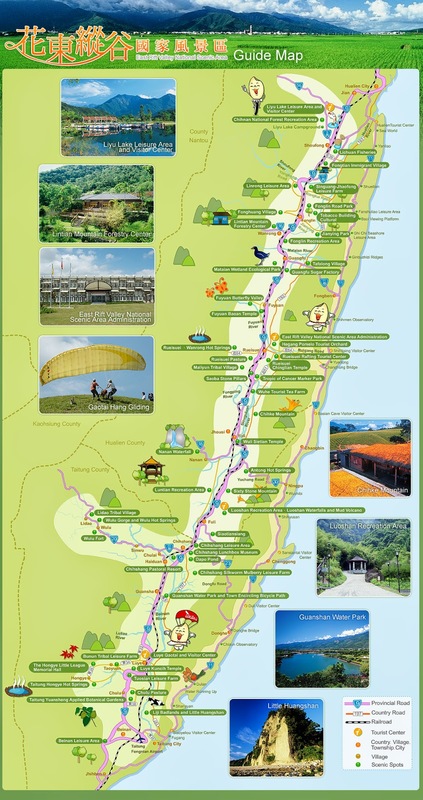 Tel: 886-3-8360634, it is hosted by Taiwan Hospitality and Tourism College, that has been authorized, by the Hualien County Government since December 2004, to operated and manage the Visitor Information Center (VIC) at Haulien Airport as well as the Hualien Railway Station. These two centers provide general services such as tourism guide and tour bus information, home-stay information, bi-lingual traveling brochure, travel inquiry, emergency handling and so on. Beibin Seashore Park, Nanbin Seashore Park and Meilun Seashore Park. A scenic area of palm trees and landscaped greenery that runs the full length of the city's foreshore. The views over the Pacific Ocean are especially spectacular at sunrise. The Abode of Still Thoughts. This small Buddhist temple at the foot of Mount North Jialiwan is the original facility of the world-famous Tzu-zhi Buddhist foundation. In keeping with the foundation's ideals, the temple is very simple, and incorporates a Japanese style garden. Information on Tzu-chi's international activities is also available at the temple. Yenpin Prefectural Temple, near Zhongyang Road, sec 4. Established in the Qing Dynasty, this is the oldest temple in Hualien. Pine Garden, Zhongmei Road (near the river). A peaceful garden with 63 pine trees. Chishingtan, north of Hualien City (follow the bike path from Nanbin Seashore Park). Excellent vistas of the ocean, delicious seafood, friendly people, and a special goat restaurant specializing in goat milk coffee. The beach is popular for swimming, though as the tides and currents are quite dangerous it is important to stay near the coast. Hualien County Stone Sculpture Museum at the Hualien County Cultural Center displays both traditional and contemporary stone sculptures. Open daily 9am-5pm. Admission fee: NT$20. The city center is small and easy to negotiate on foot, although scooters are available for rent several places around town for about NT$400 a day. The Taroko Gorge is an impressive 19 km long canyon located in Taroko National Park. The park covers about 92 thousand hectares of springs, grottoes, waterfalls, and high cliffs that enchant visitors. Highlights of the Gorge include the Eternal Spring (Changchun) Shrine and the Shakadang Trail. In the back of the Changchun Shine, there are stairs leading to Kuanyin Caves, Taroko Tower , Bell Tower, and through a hanging bridge, so called "Heaven trail" to Changuang Temple.